Several years ago, I received a Masterbuilt Electric Smoker to review after tweeting that our 10-year-old Masterbuilt propane gas smoker died. I was looking for the best electric smoker out there. After doing some research I decided to look at Masterbuilt Electric Smokers and was excited to get one to try out. Why is Masterbuilt Electric Smoker the best electric smoker? ● You don’t have to worry about it running out of propane in the middle of cooking with an electric smoker. ● It’s easy to get a correct and steady temperature with the Masterbuilt Electric Smoker with its push-button digital time temperature and time control panel. ● The thermostat on your electric smoker shows the temperature so you don’t have to guess. And Masterbuilt’s built-in meat probe displays the internal temperature of the food you're smoking. 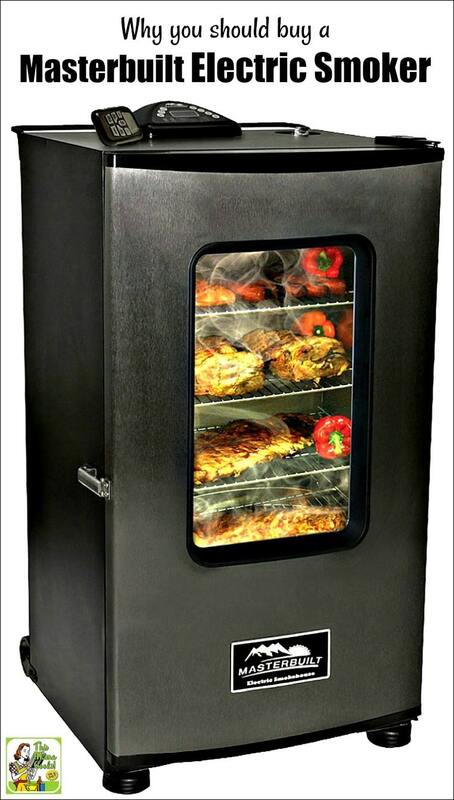 ● Masterbuilt Electric Smokers are “oven style” electric smokers with a door and racks that easily slide out. It’s so much easier to remove food from this type of electric smoker than with a stacking type of gas smoker. ● I feel electric smokers are safer since gas smokers have an open flame. Every time we used the propane gas smoker, I was certain we were going to burn down the deck. And I didn’t like having an open flame around the kids and dog. For our maiden smoker run, I made four racks of pork ribs in my new Masterbuilt 30 Electric Smoker. Putting the 1/4 cup of wood smoker pellets in the side loader was simple to do, too. (You need to put in pellets every 4 hours or so.) I liked not having to soak chips, which helped cut down prep time. It was incredibly easy to remove the ribs when I needed to wrap them in foil for the last hour of cooking. Getting an electric smoker stand makes cooking with your electric smoker even easier! No need to stoop down to get ribs off that bottom rack or getting on your knees during clean up time. Cleaning a Masterbuilt Electric Smoker is a breeze! The true test of the Masterbuilt 30 Electric Smoker (besides cooking – the ribs were FANTASTIC) was cleanup. The manual says not to use any cleaning products on the smoker interior. Instead, I filled a bottle with white vinegar and water, and sprayed down the cooled unit and inside the door. I then wiped it down with a Mr. Clean Magic Eraser sponge and a wet washcloth. I removed the racks and water pan and washed them in hot soapy water in the kitchen sink. You may want to spray the racks a high heat grilling cooking spray to make cleanup even easier. After doing some research, my husband, Paul, learned that you have to season your electric smoker before using it. That means to make sure to purchase some wood pellets (not chips) when you order your Masterbuilt Electric Smoker. I ordered BBQrs Delight Wood Smoking Pellets Super Smoker Variety Value Pack. It contains one pound bags of Apple, Hickory, Mesquite, Cherry, Pecan and Jack Daniel's pellets. If you already know you like to smoke with a certain type of wood, you may want to buy larger bags of wood pellets for the best price such as 20 pound bags of Camp Chef Bag of Premium Hardwood Hickory Pellets for Smoker. (Camp Chef also sells applewood pellets and mesquite pellets for Masterbuilt Electric Smokers). I also ordered an Unicook Heavy Duty Square Electric Smoker Cover for my smoker. A cover will prolong the life of your electric smoker. 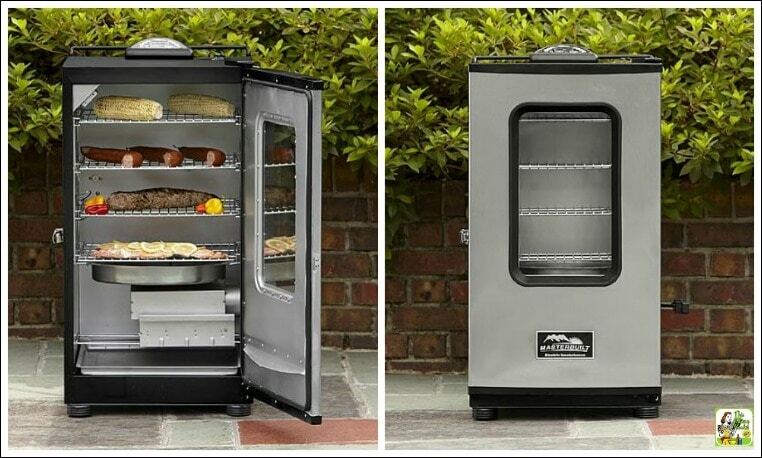 Masterbuilt Electric Smokers – which one to pick? Since originally writing this post in 2010, a number of new Masterbuilt Electric Smokers have come on the market. Check the reviews of Masterbuilt electric smokers so you can determine which one is best for your needs. During his research, Paul read that there were some issues with the older electric models in regards to getting smoke and enough power. Many consumers were having problems with the heating element as well. So I requested a short email interview with Masterbuilt to answer those concerns. This Mama Cooks! : From the online reviews of the Masterbuilt electric smoker, I’ve noticed that people have a tough time getting enough smoke. What are your best tips for getting “good smoke”? Masterbuilt: You will achieve best results by not soaking your chips in the electric smoker. TMC: I’m seeing online complaints about the heating element failing after a year of use. Is it still true that there is no replacement part for it in latest model? What should you do if you have a unit with a broken heating element? Masterbuilt: We have redesigned the smoker in 2010 to allow the heating element to be replaced, if need be. For customers with older models, we will need to work with the customer to replace the box and element. TMC: What type of warranty does the smoker have? TMC: I’ve read that some people have issues with the unit getting enough power and that you shouldn’t use an extension cord with the electric smoker - is that correct? Masterbuilt: Yes, when you use an extension cord, customers may see a drop in amps. Our recommendation is to not use an extension cord to achieve best results. However, if an extension cord is needed, it is best to use a heavy duty cord with a 14 gauge minimum. TMC: Maintenance – what are the best ways to keep your Masterbuilt electric smoker working at tip top shape, from cleaning to storage? Masterbuilt: Make sure to clean the unit after each use. Also, it is important to store the unit in a dry area or use an Unicook Heavy Duty Square Electric Smoker Cover to protect your unit. Originally published June 19, 2010 and August 4, 2016. Updated with new pictures and information. Photos supplied by brand. Posted in Products and Equipment and tagged grilling and smoking on April 6, 2019 by Anne-Marie Nichols. Can you use the wood pucks with this smoker? No, Christina. You have to use the pellets as that’s what fits in the tray. If you already have pucks, you could try chopping them up in small pieces. Don’t know if that would work as well, but I hate not being able to use what I already have on hand. I just purchasd the Masterbuilt 40 inch Bluetooth smoker. So far so good, however after setting up the bluetooth feature on my phone, I coundn’t get the phone to connect to the smoker. I was sitting inside the house about 12 feet from the deck where the smoker was .I went directly in front of the smoker and it worked fine, um why have it? Any suggestions? I have no idea Mark. Is there something blocking the signal? I bought my digital smoker (non-window version) and the cold smoke box. I had read that the cold smoker provided more consistent smoke. I also read that it does not get much below 100F, so if you want to truly cold smoke, using some ducting and patching it together works. So, this is probably the cheapest combination if you ever want to try making your own smoked cheese and salmon.